A distinctively different every day carry, this elegant folder features a black G-10 handle that offers superior grip for deployment and use. Dual thumb studs afford ambidextrous one-hand deployment and a liner lock keeps the blade steadily in place. Gerber&apos;s classic Air Ranger, designed by acclaimed knife maker Bill Harsey, gets an assist with a new G-10 handle to deliver the superior grip expected of this iconic knife. Possessing an elegant fine edge clip point blade, the folder packs a serious punch. 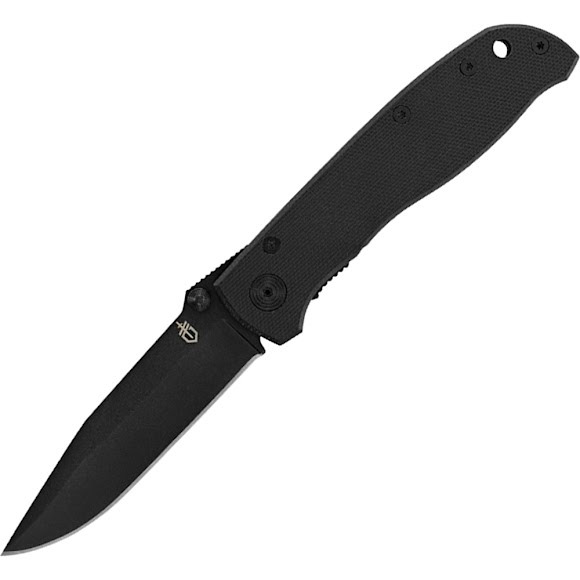 The Air Ranger Black G-10 folding knife is a great, logical daily carry for addressing trouble efficiently. Establishing the Air Ranger as distinct from similar folders is its innovative handle. The ultra-tactile G-10 offers you steady purchase while deploying the blade. Its one-hand opening releases with a thumb using the dual thumb studs positioned near the hilt, and the liner lock keeps the blade open safely during use. Make dexterous use of this sturdy knife in all conditions. Overall Length 7.3", Closed: 4.2"